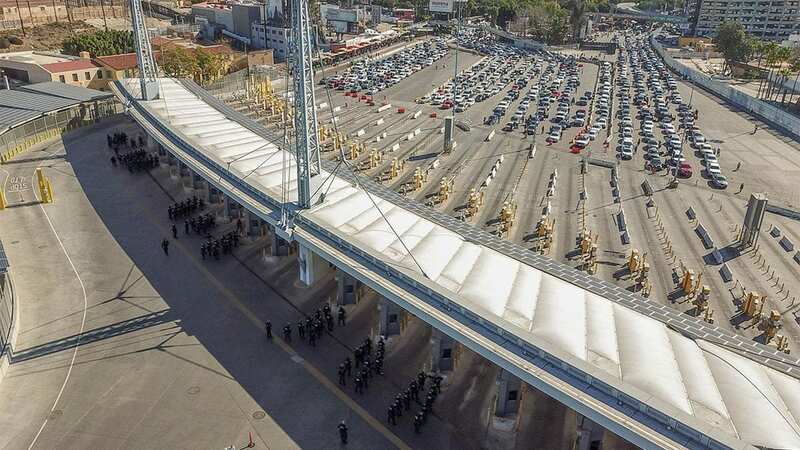 Personnel from Customs and Border Protection and the Defense Department secure the San Ysidro Port of Entry against attempts to illegally enter the United States from Mexico. Border agents seized more than $2.7 million in drugs in five days and arrested 39 people along the California-Mexico border. Customs and Border Protection (CBP) officials said agents across six ports of entry stopped numerous attempts to smuggle drugs across the border beginning on Friday. The latest attempt, made Tuesday morning at the San Ysidro Port of Entry, resulted in the confiscation of 270 pounds of methamphetamine hidden inside a vehicle. The suspect, a citizen of Mexico and permanent resident of the U.S., was arrested. According to a press release, agents arrested 10 people in connection with smuggling attempts, and seized 580 pounds of meth, five pounds of cocaine, some 26 pounds of heroin and 17 pounds of fentanyl. The value of the narcotics: roughly $2.7 million. “In addition to dealing with the arrival of a large caravan of migrants and the processing of asylum claims, CBP officers within the San Diego Field Office continue to seize narcotics and arrest wanted individuals, all while performing their traditional duties of processing lawful trade and travel,” said Pete Flores, director of field operations in San Diego. An additional 14 people with warrants were arrested and another 15 were arrested on charges of human smuggling, fraudulent documents and immigration violations. Those arrested at the border were not immediately associated with the caravan of migrants seeking asylum in the U.S.
‘Imperative’ that ‘No One’ from Caravan Enter U.S.